Navicular Syndrome: Does FDA Approval of Tildren and Osphos Change Anything? 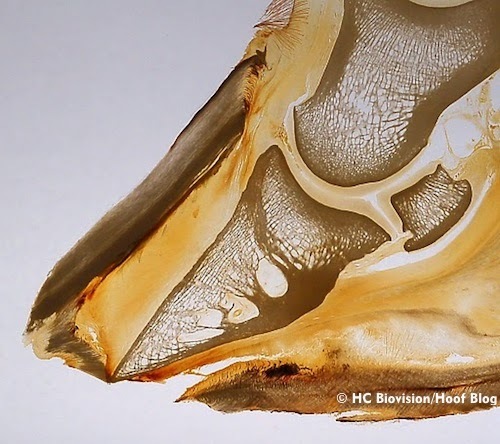 From bone to zone: Focus on navicular-type lameness has evolved from concentrating on identifying bone defects visible in radiography to a more dynamic approach to also detect possible soft tissue injury, deteriorating hoof condition and age- or sport-related stress factors. 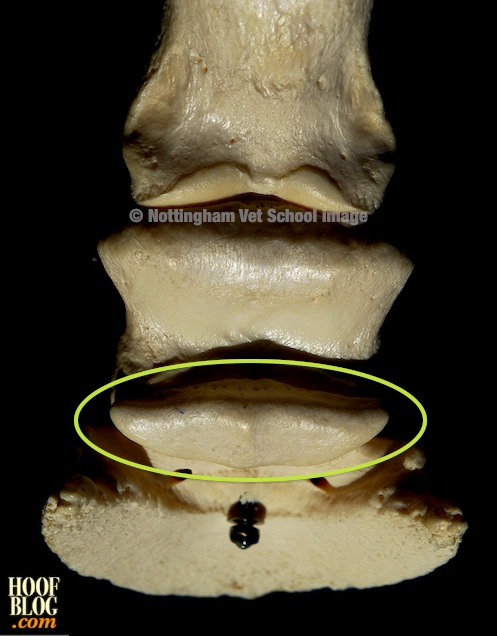 The navicular bone is circled in this distal limb bone model at the University of Nottingham Vet School. 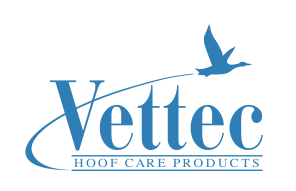 The landscape of treatment options for equine navicular syndrome is set to change this year, as the U.S. Food and Drug Agency (FDA) recently approved two drugs for use in the treatment of this complex lameness problem in the horse's foot. "Tildren" and "Osphos" are two specific medications that cleared the difficult hurdles of the FDA approval process in May 2014. 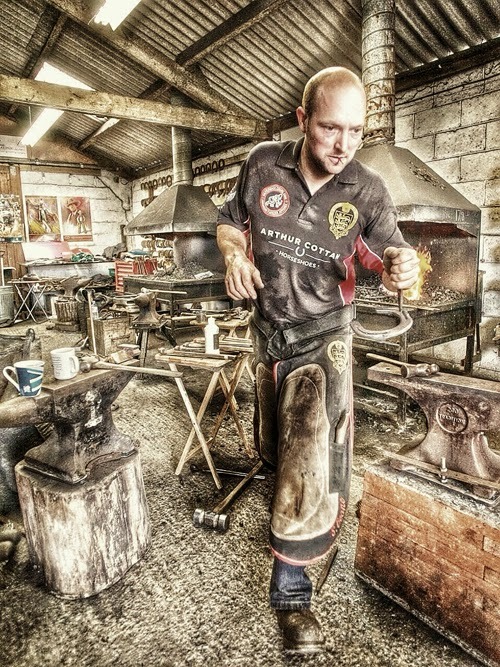 Congratulations to Scottish farrier David Varini, who has just been declared the winner of the European Farriery Championship, held this weekend in England. 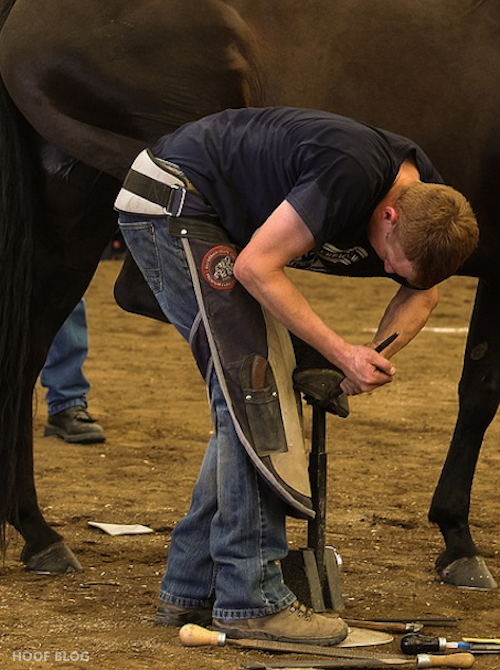 The European Farriery Championship is in full swing this week in England; here's a list of the farriers and nations who made it through to the "Top Ten", and are competing today, Sunday. 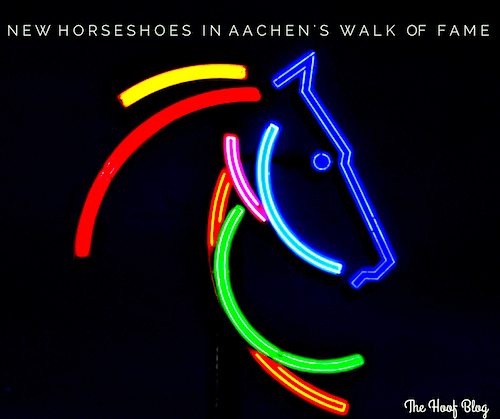 Whose Horseshoes Did CHIO Aachen Add to the Walk of Fame? If you were a horseshoe, where would you like to spend eternity? If you'd been on a sport horse, the answer is the hallowed Walk of Fame, a plaza at the showgrounds of CHIO Aachen, the national horse sport championships of Germany and international showcase of the competition horse. 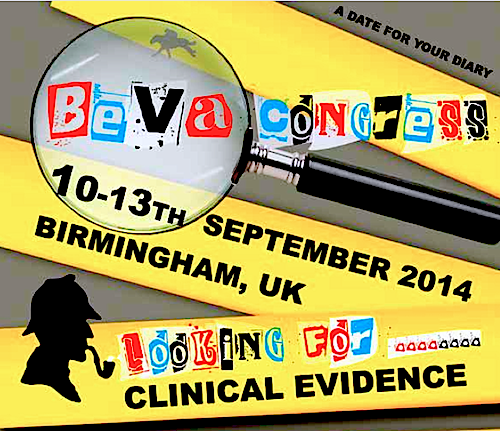 The 2014 "BEVA Congress" or annual convention of the British Equine Veterinary Association, has announced the addition of a full day program on farriery and foot lameness for Saturday, September 13. The Congress will be held at the ICC in Birmingham, England, where five separate scientific programs will run concurrently in five lecture halls over the three days of congress,. Foot problems can commonly cause horses to be scratched from a race, lose training days, overload other structures and have shortened careers. Just when you thought laminitis research was starting to make some sense, the landscape changes. If you haven't been keeping up with laminitis research for the past few years, you've missed grass being given a get-out-of-jail-free card for its lack of a direct role in causing laminitis. Steven Beane practicing at home before Calgary. Photo by Aaron Kampfer, used with permission. 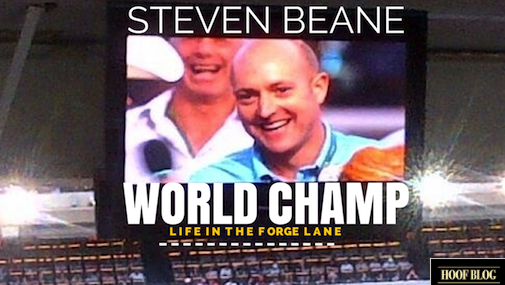 Unofficial news from the Calgary Stampede has placed English farrier Steven Beane in the enviable position of having just won his fifth--and no doubt last--world championship at the Calgary Stampede. 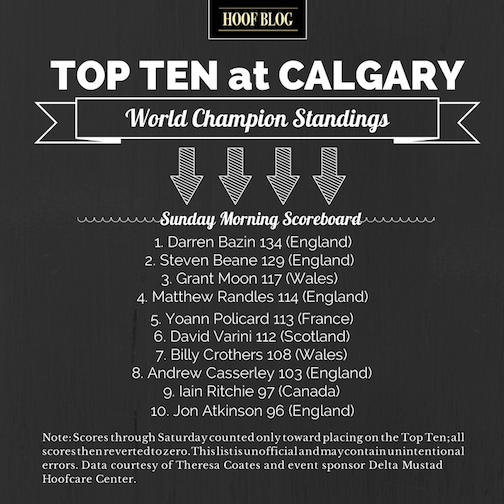 The Calgary Stampede World Championship Blacksmiths Competition is over the hump. Competition through Saturday was an elimination series that was a complicated dance of simultaneous divisions run under timed conditions. 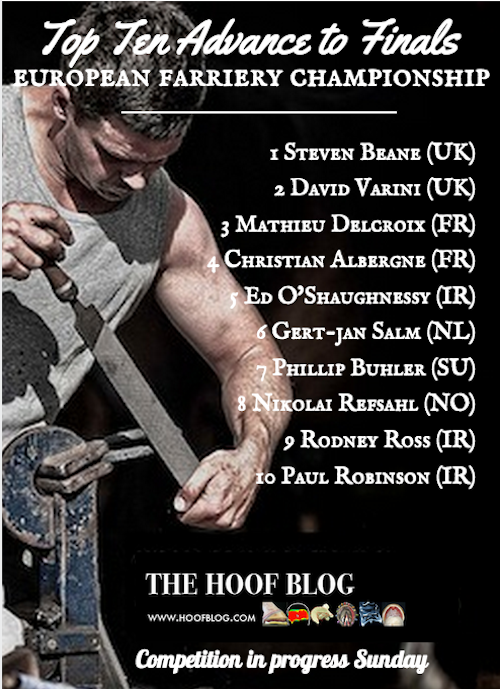 At the end of it all, ten farriers emerged as the "Top Ten" who would go forward for the title of World Champion. 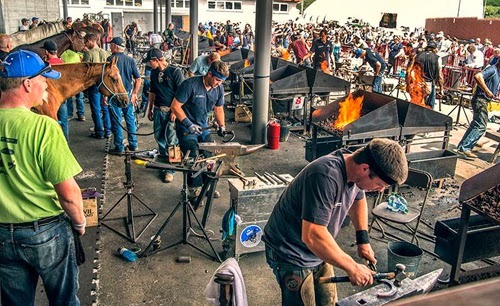 The 35th (and final) World Championship Blacksmiths Competition at the Calgary Stampede entered its second day today, although it was technically the opening day of the Stampede itself. Kerr Corporation, a global manufacturer of healthcare products, announced today that it has acquired DUX Dental and Vettec Inc. The acquisition will unlock new worldwide opportunities for growth in the large animal healthcare market. 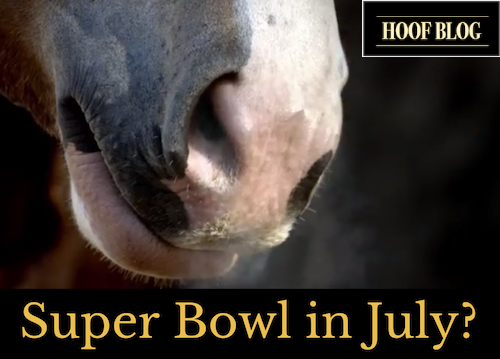 This article has nothing to do with hooves, except for the fact that the Budweiser Clydesdales have big, heavy, famous ones. By tonight, everyone will have seen this commercial, but here's a preview of what will surely make a delightful culture clash during ESPN's broadcast later today of the USA-Belgium match as the next level of FIFA World Cup competition begins for Team USA in Brazil.